And it’s not one of those stories that has a beginning, a middle, and then a perfectly tidy hind end either. It’s really just a beginning. Some days it led to actions the Lord gently nudged her to take. Other days it led to reflections the Lord gently whispered into her heart. Every day it led to a single word, one underlying theme that ties all thirty days – all thirty chapters – and their wide variety of topics together: giving. These thirty days found Kendra and her husband and daughter in a strange time of transition. They had just moved back to the United States after teaching for three years in the beautiful country of Guatemala. They were in a new city, working a new job, living in a new apartment building, in search of a new church. And they wanted to put it all together: all of their experiences, all of the things they had just seen and learned and read and discussed. It wasn’t a clean slate but rather a chance to live intentionally. It might sound like strange advice, but it made sense. Jesus tells us to “Love God and love your neighbor.” Many times the word neighbor is meant to be vague, but it shouldn’t always be. Part of being mission-minded, no matter where you live or work, is being willing to love the people closest to you, people we often overlook. Kendra’s neighbors—as in the people who live in the other eleven apartments in her building—are whom she often found the Lord’s generosity overflowing to and from during these thirty days. Broekhuis spent three years as a missionary in Guatemala with her husband, and the move back into life in the U.S. was harder than she expected. She recalls that her biggest criticism was of American churches. Given the level of poverty and want she witnessed living in Central America, the U.S.'s gross wealth and unenthusiastic spiritual community made her uncomfortable. It seemed paradoxical that Guatemala could sustain such a vibrant religious community with so little material support, where back home there were so many resources but little true connection. To remedy this internal tension, Broekhuis began a 30-day challenge to love her immediate neighbors in practical, everyday ways. Broekhuis, an introvert, first tentatively dipped her toe into the waters of serving her apartment neighbors by leaving quarters by the laundry machine, making cupcakes, and praying for a man whose car wouldn't start. 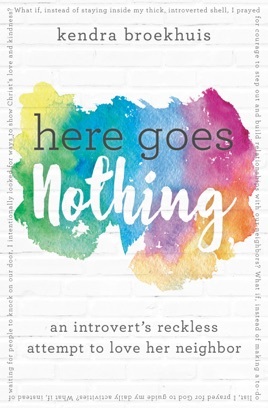 Over time, God started nudging her to connect in more personal ways and, as she obeyed, Broekhuis found herself changing from the inside out. Her essays are perceptive and clever as she ponders her motivations for not getting involved in her neighbors' lives. As Broekhuis outwardly writes about the experience of engaging with her neighbors, she creates a finely reasoned account of why having a spiritual community is so important.